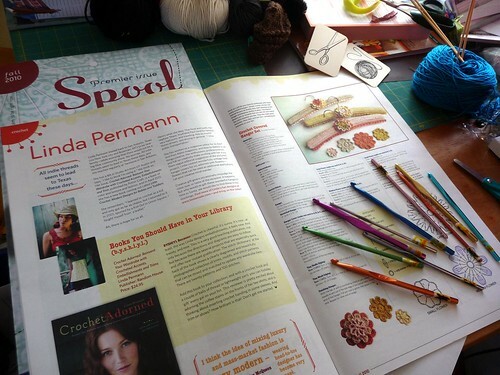 While walking the floor at TNNA (The National NeedleArts Association) this summer, a friend told me about a new magazine venture called Spool. I went over to the booth and the design of the promotional materials caught my eye, but De Selby, the editor, was away from the booth. I left my info and said I’d be back, and I swear, I probably circled the booth twenty times before I met De. Greg, her husband, was so nice about it and hopefully, but I was borderline stalking her by the time I got to meet her. I was so excited about the idea of the new magazine, and I wanted to be involved. She ran the idea of a crochet covered hanger project by me and I happily obliged (see the ravelry project page here). 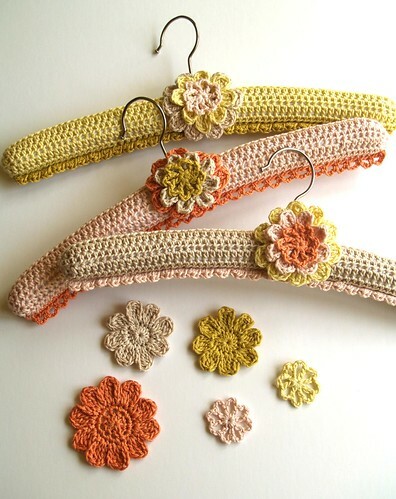 Each padded hanger is covered in a solid crochet fabric and a tiny contrasting trim (that also functions as the “sewing up”), then layered with easy-to-work flowers in a range of colors. I used Berroco Pure Pima (DK) because I just loved the soft yet spicy colors. Of course you could work them with any DK-weight scraps, and just in time for holiday gifts. They just feel luxurious, and I thought maybe I needed to go buy some new, nicer clothes to hang on mine. But until then my t-shirts are hung with the most excellent care. Other projects include a knit dinosaur cap for kids, a pretty tea cozy, crocheted cocoa mug pin cushions, and a host of embroidery, needlepoint, and even punch-needle patterns. Ask for Spool at your local yarn or needlework shop or subscribe online. If you are in the San Antonio-ish area, it’s available locally at the Tinsmith’s Wife in Comfort and at The Knitting Nest in Austin. And with Yarn Crawl coming up this weekend, I have a feeling you might be headed that way anyhow! I can't wait for my first issue of Spool to arrive! I subscribed immediately! I know it will be fantastic and I just LOVE those hangers. I will have to make some for sure! That's great, I hope you like it! It hits a lot of different crafts and styles, which I always think is a good thing. I've been itching to make some more hangers myself, they just feel luxurious! I'm sure I'll love it. I am properly obsessed with anything to do with yarn or thread so this mag sounds like it will cover all the bases! Wasn't it fun to be part of the first edition? Love your work! It does look like a great magazine - lovely items in it too!